Hi guys! This will be my first real Ludum Dare, because I couldn’t participate in the previous one. I’m NOT good with pixel art but I can make some decent simple art with vectors. FAKE it till you make it! Music: If I have time I’ll make some sounds and music with Reaper, if not, I’ll use some from opengameart. Progress! After about an hour of brainstorming, and an hour of Cake going to a company happy hour (Sorry Zeik! ), here is a screen of our first 5 hours of progress. So far this is Cake’s screen. Lots of Illustrator-ing going on. It took her a good 20-30 minutes to art direct the mood and theme for the game, but so far she’s got character design completed, a few obstacles, and the background. Before the end of the night is over (+ a large cup of coffee) she plans on having most of the world created and brainstorm a few level ideas with Zeik. 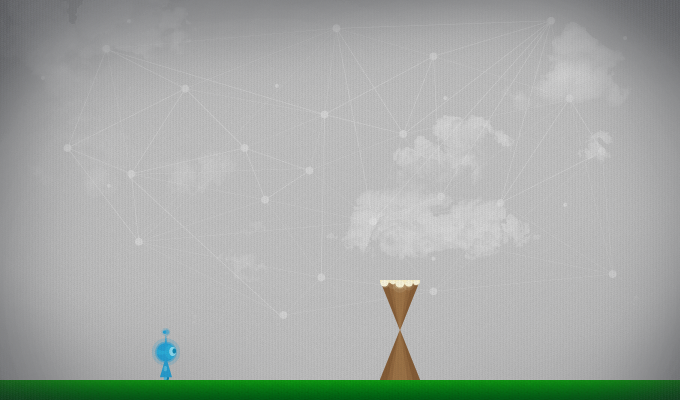 But the main goal for now is to have most assets created and dive in to the main screen. Zeik is trying to keep up with the art, since Cake is “pumping out more art than [he] can keep up with”. Despite that, the game is somewhat playable. Still trying to integrate a flux capacitor (har). No, but seriously, we have some game mechanics to hammer out. That’s the goal for tonight….sort of? He’s just trying to do work. Our current work station and dinner. Not pictured is the giant Starbucks cup that Cake is gulping like water with blearly eyes and the moleskin she relies on like a life-jacket. Ya, we both really enjoy hot wings. So that’s our progress so far! We’ve set pretty good goals for ourselves for tonight and tomorrow. Neither of us really plan on sleeping before 3am. Ludum Jamming To: Edward Sharpe & The Magnetic Zeros – Up From Below, possibly going to switch to Cake’s fabulously 80’s mix. Rainy Birthday – Our Warm-up Game! Oh man, this one was a little bit of a killer for us simply because we barely had any time to work on it consecutively without reaching deep into the night and waking up with bags under our eyes for work. But it’s done, huzzah! The game was built with a custom engine that Zeik coded (and will later regret to do, as we’ve decided to move onto Flashpunk for our official LD jam). The art and UI was created by Cake in Illustrator and then Photoshop. Music was originally JakesFables from Newgrounds, and edited by Cake and Zeik.